Poetry can be a tenuous thing, especially in the world of speculation. Hooray for champions like Matt Betts, whose chapbook See No Evil, Say No Evil collects some fine examples of speculative poetry that manage to cut a razor's edge between funny and poignant without alienating a reader. Take "The Redneck Future that Awaits Me" for example. The speaker understands his social position might not be improved in the science-fiction future, but at least "we will have conquered rust". Then you have the laugh-out-loud "Nobody Eats Porridge Anymore" in which the bears exact a brand of revenge on the "little blond girl". One of my personal favorites is the brief "Science 101 Destroys All Hope"...something I've been trying to tell a few of my colleagues for years. Maybe finding a penny doesn't lead to good luck, but who wants to live in that world, anyway? There are no heavy rhyme schemes or rigid meter to contend with in these poems, and you won't find allusions lost in Greek and Latin history. 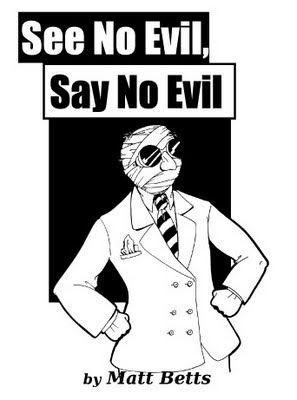 No, the only prerequisite for reading See No Evil, Say No Evil is a sense of humor and appreciation for the imaginative. A good background in late night B-movies doesn't hurt, either. See No Evil, Say No Evil is still available directly from Matt Betts for the ridiculously low price of $7 + S&H. Go on, choose evil.